The show began with a bang, as Vassar’s new President, Elizabeth Bradley introduced the night’s speaker, CFDA shoe designer and entrepreneur Ruthie Davis. Coincidentally, Bradley and Davis grew up together as best friends in New Britain, CT. Bradley even surprised Davis with a copy of their middle school yearbook, providing laughs for both themselves and the audience. In return, Davis gifted her old friend a pair of shoes -- sensible flats. After hilarious banter between the old friends, Davis began her presentation, Women Who Run In Heels Should be Feared. She started with a photo of herself as a toddler, running through her front yard in her mother’s high heels. Even at a young age, Davis loved trying on and experimenting with different shoes. Wearing heels or platform shoes made her feel unlike anything she had ever felt before -- tall and powerful; in heels she became the best version of herself. Davis’ journey from a shoe-obsessed teen to an acclaimed shoe designer was winding. She landed her first executive position at Reebok, where she was charged with revamping the Reebok Classics line. From there she moved to UGG Australia, working to bring the UGG boot fad, so loved by West Coast valley girls, to the snowy northeast. At UGG, she found that adding fur to the outside of the boot, along with a thick rubbery sole, created a chic but practical option for the cynics of the East Coast. Her ingenuity and willingness to push the envelope led her to a position with one of her style icons, Tommy Hilfiger, before deciding that her dream was to build her own company and brand. In 2006, she launched RUTHIE DAVIS, and began to develop her shoe empire. The lesson Davis learned from her time at UGG proved to be one she would use throughout her career: pairing style with practicality. RUTHIE DAVIS shoes strive to maintain both comfort and style; while the designs are bold and bright, most have platforms that provide extra support. So what’s next for Davis, now that she has built her brand? She gave the audience a sneak peek of her newest project, a collaboration with Disney to create a line of shoes inspired by our favorite princesses, Snow White, Sleeping Beauty, and Belle. As if her speech wasn’t enough to prove the power of women and the beauty of a well-designed shoe, Davis sprinted across the stage in six-inch Snow White platform heels, garnering lively cheers from the audience. Following the gusto of Davis’ speech, the fashion show began. Davis’s speech was the perfect introduction to the catwalk. Sixteen student models strutted down the runway, showcasing embellishments with pieces from statement jewelry, to belts, to wire crowns. Twelve of the sixteen models sported outfits styled by Contrast’s style team. 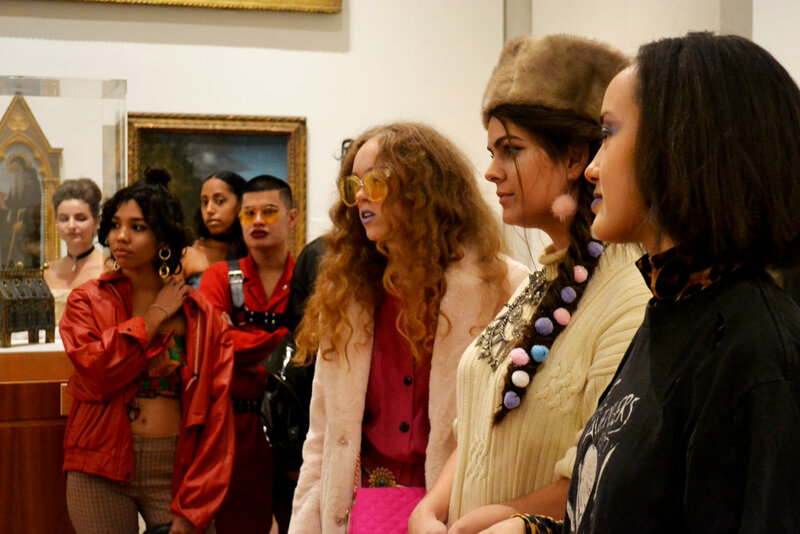 The other four were treated to historical looks prepared by Kenisha Kelly and Pam Prior of Vassar’s Costume Shop, including extravagant hoop shirts, boas, wigs, and Rococo coats. DJ LXRDFXRD’s electric tunes matched the tempo of the show. The show was a great success, triumphantly showcasing the power of being Embellished.